The lady robot AILA is testing technologies for future space robots. A space robot with a female form could someday join NASA's humanoid robot in helping human astronauts aboard the International Space Station. 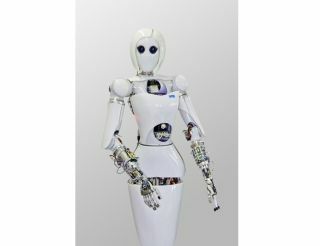 Germany's AILA robot has a female figure, a head molded into the shape of a modern female hairstyle, and large, dark eyes — a different look compared with the broad-shouldered torso and space helmet head of NASA's Robonaut 2. But both robots could have the right stuff to show how humans and robots can work together more efficiently in future space exploration. "We must build systems that approach the capabilities of the people," said Dr. Frank Kirchner, director of the Robotics Innovation Center at the German Research Center for Artificial Intelligence and the Robotics Group at the University of Bremen. The German Aerospace Center (DLR) recently agreed to invest $4.59 million (3.8 million euros) in a project designed to improve the software brains of AILA and similar space robots. Human operators on the ground have controlled AILA using a specialized mouse and even Microsoft's motion-tracking Kinect technology for the Xbox video game console. AILA has also shown how it can mimic a human operator's arm and hand movements and learn how to push buttons or flip switches on its own — necessary skills for working in Earth's orbiting space lab. AILA's software learned to efficiently move its arms and hands by taking the recording of a human's motions, chopping the motions up into smaller segments, and then piecing the segments together to create its own new actions. That creates a library of behaviors for the robot to sample whenever it needs to do something new. The Besman ("Behaviours for Mobile Manipulation") project is expected to run over the course of four years based on the German space agency funding. Eventually, it could create the robotic brains for the next generation of humanoid robots that could join the U.S. Robonaut 2 aboard the space station. Such learning software could work in more than just humanoid robots — it could also guide spidery robots with many legs or other different forms. That means it could prove useful for a wide variety of space robots working inside or outside the space station, or even on the moon or Mars.